Sharon Johnson's challenge for last Friday was a "modern" card. Today is the first chance I have had to get a card made for the challenge. I am trying to catch up my bookwork so I can get our records to our tax accountant. Anyone else know the feeling?? When I created this card, I wanted something bright and cheerful and modern looking. Now some of you might not agree with me, but to me this sophisticated lady comes across that way to me. What are your thoughts on this? 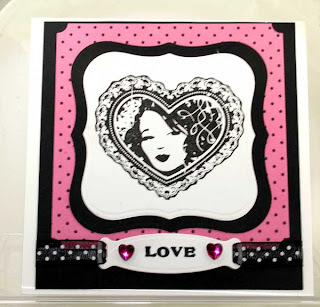 Black and pink make such a striking card and just in time for Valentines Day. I think this is a GREAT card Joan!! Love your color choice and I agree ... she looks quite confident in herself!! Great interpretation!! It's just darling, Joan -- I love the pink and black -- very striking indeed!!! So glad you could play! Great card! That pink and black is so pretty, and that lady image if perfectly modern!! honestly, the image looks vintage but the card looks modern. Does that equal modern overall? Not sure. But I do love it.